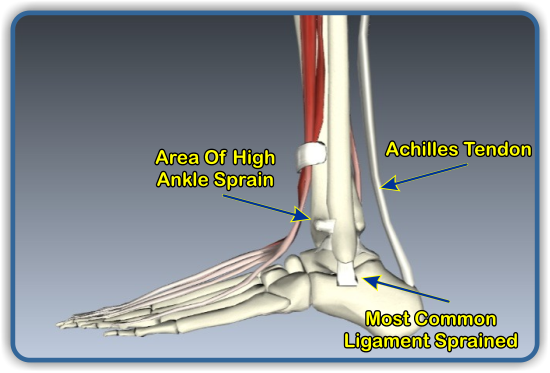 Ankle sprain is a common event in contact sports. Anyone who has played soccer, football or other sports that include running and jumping has more than likely had anywhere from a mild to moderately severe ankle sprain. Other activities that can result in an ankle sprain include dance line, dance or working on uneven ground. 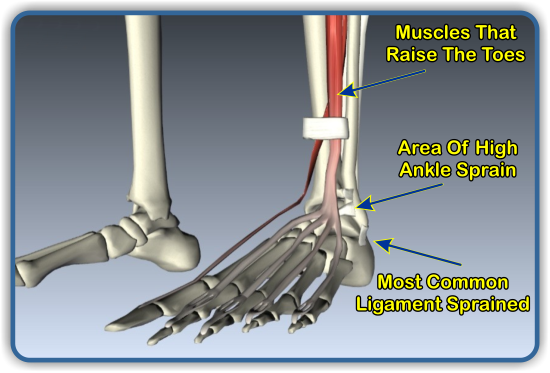 Nearly 85% of ankle sprains occur on the outside of the ankle. This is called an “inversion sprain”. The lateral collateral ligament is damaged. This also includes ligaments that attach to the fibula, tibia and large bones of the ankle. Those structures are the most vulnerable. The description given to a trainer or doctor is “I felt my foot just roll over.” When this happens the injured individual may hear a “pop” or a “tearing sensation” in the ankle. Protecting the injured ankle as quickly as possible will help with the recovery. The “eversion sprain” or the ankle rolling in is very infrequent, but when it occurs the sprain can be more severe. The medial collateral ligament is injured. Fractures may be present and many times surgery may be required. Grade 1 – Localized tenderness with no discoloration around the ankle. There may be a slight limp or no limp at all. Grade 2 – Bruise noted on either side of the heel and swelling noted around the ankle joint. Pronounced limp that can be present from a few days to a couple of weeks. Grade 3 – Wide spread discoloration and swelling around the ankle. Loss of definition of the Achilles tendon and the inability to bear weight on the ankle while walking. Fracture needs to be ruled out. The high ankle sprain is a more serious injury to the ankle joint. The injury involves ligaments and fascia above the lower outside of the ankle. 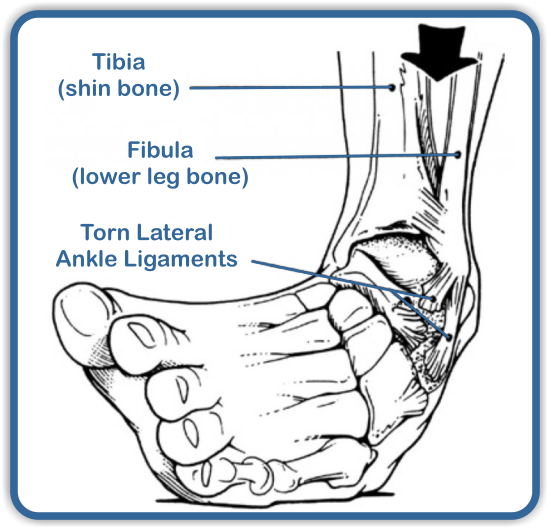 These ligaments are an attachment between the tibia and fibula. The purpose of these ligaments is to add stability to the ankle joint by strengthening the attachment of the two bones. The ankle takes a significant amount of stress and strain from running and walking. Injury takes place when the ligaments are torn. Thankfully, this injury is less common than the “inversion” sprain that occurs to the lower outside of the ankle. The cause of the high ankle sprain is from a sharp rotational move to the ankle. It is common in impact sports such as football, soccer, basketball, and volleyball. It can happen in the yard or at a work site by stepping in a depression or shallow hole in the ground causing your ankle to twist. Treatment may take 6-8 weeks and in some cases even longer to heal. In addition to usual case management for ankle sprain, a walking boot may be necessary. If a fracture of the tibia occurs and surgery is necessary, it could take 12 weeks or more. This injury is not to be taken lightly. Maintaining a good range of motion during the healing process is important for a good recovery. Following your doctor and therapist’s treatment recommendations will assist in a favorable recovery. Treatment may take 6-8 weeks and in some cases even longer to heal. In addition to usual case management for ankle sprain, a walking boot may be necessary. If a fracture of the tibia occurs and surgery is necessary, it could take 12 weeks or more. This injury is not to be taken lightly. Maintaining a good range of motion during the healing process is important for a good recovery. Following your doctor and therapist’s treatment recommendations will assist in a favorable recovery. Consulting a doctor who cares for injured athletes and understands the healing cycle is the best choice to minimize the ankle becoming a chronic and reoccurring problem. This could adversely affect future sports performance or ability to work at some occupations. The doctor will be doing an examination to see if ligaments have been torn or other damage has occurred to the ankle. Examination procedures will be used to indicate the extent of the ankle injury. The doctor may have x-rays taken or order a MRI. Fractures and total tendon tears need to be considered. Guidelines have been established for the use of x-rays for an ankle injury. For the first 3-5 days the use of RICE (rest, ice, compression and elevation) should be followed. Weight bearing should be avoided and the use of crutches is recommended. Your doctor will re-evaluate your ankle at this time and possibly a short ankle cast or support will be applied. Treatments such as ultrasound or other electrotherapy can help control the acute pain and expedite the recovery so other treatment can be given. With improvement joint mobilization can be done to facilitate the recovery and establishing correct joint movement. Rehabilitative exercise will now begin to include range of motion, proprioceptive training and recommendation of strengthening routines. These will be non-weight bearing. Should the therapy fail to achieve the goals that were set after the injury and chronic ankle instability occurs, a referral to an orthopedic surgeon should be considered for further evaluation. Approximately 30% of patients have pain and swelling for at least 6 months after the injury. Some restrictions and limitations may occur with these injuries to include work and sports activities. Less than the desired level expected in athletes has been reported by about 70% of the athletes with residual disability in the ankle. About 20% of athletes will have re-injury to the ankle. Begin walking and bearing weight as tolerated. DON’T overdo it! Once therapy begins, precise exercises for proprioception rehabilitation is needed. Advanced imaging (MRI) may be needed if weight cannot be tolerated or chronic pain (even at night) is present. If you have any questions, write them down so they are not forgotten the next time you see your doctor or therapist.